Yesterday, for the first time since July, I picked up my knitting needles and started a new project. I have quite a lot of knitting planned as Christmas presents and when I shared my a shot of my Ravelry page in the Unusual Hobbies post, I realised I need to knit for myself too! So because the theme for today's Blog Every Day in November is lists, I've composed a list of some crafts I want to do for me, me, me! 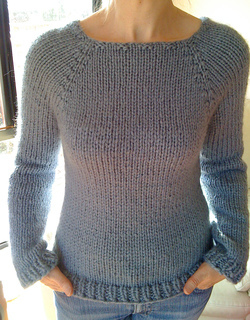 This jumper is by Jenifer Stark and is free on Ravelry as the Super Birthday Sweater. I bought enough wool in the New Year to knit a jumper out of chunky wool and with one of my Crafting Resolutions this year being knit a proper garment of clothing, this would be perfect! I have some King Cole Galaxy Chunky in Fuschia which is just my type of colour! 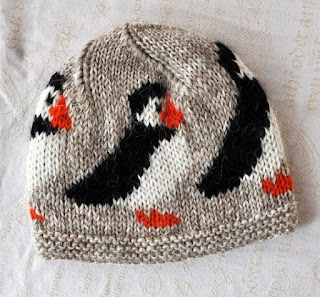 So this hat I originally pinned from Etsy and the link no longer brings me to the product nor does it list the user so I can't credit it properly at the moment. I do know it's made in Iceland with Icelandic wool and I just LOVE the puffins on this. I'll have to do up a pattern to make this but it's so cute, I already have all the yarn I need for this. Mid Century Modern style has recently peaked my interest, it's something I want to explore more. These simple starburst glasses from Palm Springs Style is perfect to introduce some Mid Century Modern flair to my house. 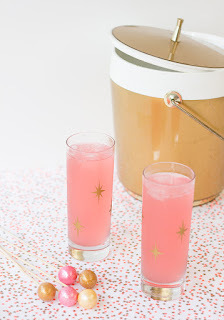 I want to look into more DIYs from this era too, I feel a new love affair coming on! And that's it! Well, that's not really it, there's loads of other things I want to do but baby steps. It's been a while since I've crafted properly and I don't want to overwhelm myself. As for when I'll get these done, who knows?! After I finish everyone else's Christmas presents I guess. I need to get cracking on those!